The Rialto has not only been Venice’s financial center for much of its history, but it’s been a commercial hub as well, and it’s one of the most advanced in Europe. Here you’ll explore the vibrant open-air Rialto food market where the stalls are filled with every imaginable kind of fruit and vegetable and end your time with a Venetian mask making tour designed to give insight to an important artisan tradition. From the top of the famous Rialto bridge, you will encounter all the splendours of the Grand Canal, as you head into what has been the city’s financial and commercial center for much of its history, and one of the most advanced of Europe. Each morning the market, which surrounds the district, is the liveliest corner of Venice, full of locals buying fresh fare from the vegetable and fish stands. The Rialto is always the best place to sip a glass of wine and try some local finger food. Next, visit the nearby is the Franciscan church of Santa Maria dei Frari with precious altarpieces by Titian and Giovanni Bellini. During your visit to the Basilica di Santa Maria Gloriosa dei Frari, you’ll marvel at the sumptuous works of art – by such notable artists as Bellini, Donatello, and Titian – that adorn the church. 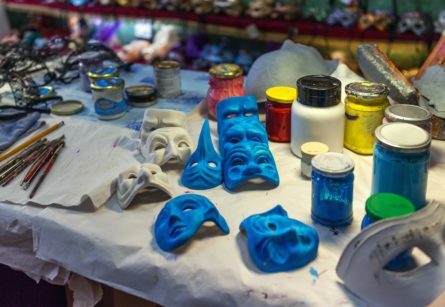 Your tour continues with a visit to the Venetian mask makers where you’ll learn all about the city’s famous masks and how they’re crafted by true Venetian artisans.